The exact end of the Golden Age of Piracy is a matter of debate. 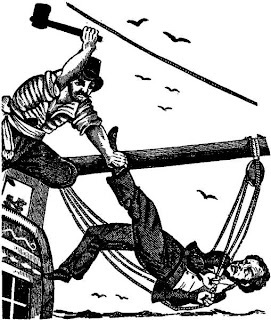 For a long time, I have thought that the death of Calico Jack Rackham (November 18th 1720) ended the most important pirating adventures of the Golden Age. But for sheer rage and pirating spirit, I have come to believe that Captain William Fly extended the Golden Age by sheer force of will. Fly had a short career. Like most pirates, his birth date is uncertain, though he is believed to have come from Jamaica. There are no records of Fly having in his past any sort of family connections or respectable trade. The earliest reports of him list his occupation as “prize fighter,” a remarkable fact, given the history of prize-fighting at the time. Simply put, fighters of the time used no safety equipment, and there were no rules. 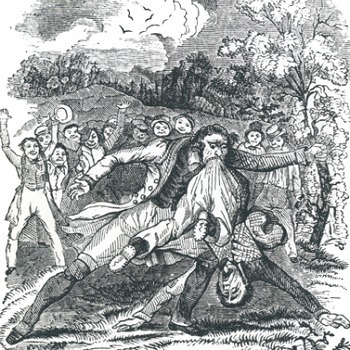 Biting was common (many men lost ears or noses.) Eye gouging was acceptable, and scooping an opponent’s eye from its socket was an art form. It was perfectly legal to punch or even kick below the waist, grapple, and stomp on a downed opponent. Only the very tough and/or the very desperate took up this kind of thing as a profession. It’s safe to say, William Fly came from a poor family. Fly, however, was not maimed, and quit the game to become a sailor. Once again, we don’t know how long he worked at this profession before he came to the attention of the authorities. We do know that he was rated as bosun, a responsible supervisory position, when he shipped out with Captain James (John) Green of board the Elizabeth in 1726. Contemporary accounts say that Fly wanted to make a fortune, and that he had become a fighter to win one. These same accounts say that Fly turned to piracy as a get-rich-quick scheme, and hint that this was the only reason he took up work as a sailor. But the fact that he was rated as bosun indicates that this was not the case. While ship’s captains sometimes held their positions due to family connections or financial investment in the ship, men with “blue collar” positions such as bosun need to be skilled at their jobs in order to make the ship work. A bosun scheduled work crews, and maintained the deck, ropework, and sails of the ship. Since a ship of the day contained literally miles of rope, each piece with a distinctive name and function, and had a wide variety of sails that needed to be constantly raised, lowered and adjusted due to wind and weather, this was not a job that could be mastered in only a few months. Contemporary accounts also claim that Fly became a pirate because he was too “lazy” to work as a regular sailor. However, these accounts do not explain how, if this was the case, Fly persuaded the entire crew of the Elizabeth to mutiny. 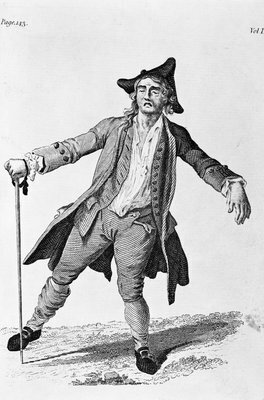 I believe that it is significant that the captain, Green, was lying drunk in his bed when the mutineers woke him and dragged him on deck. They seem to have been in a rage, though the cause of this has never been explained. Certainly some merchant captains abused their men terribly. Whatever drove Fly and the Elizabeth’s crew to mutiny, they lost no time in throwing Green and his first mate, Thomas Jenkins, into the sea. This in itself was an unusually violent act. During other mutinies from the period, captains were put off in the ship’s boat, or left on a deserted coast. In fact, during at least one mutiny, the mutineers merely took the ship back to port and got off, and went looking for other work.. So Fly and his men were enraged. After drowning their former captain and first mate (neither of whom went down easily, and both of whom had to be beaten off the side of the ship with weapons) they made a big batch of alcoholic punch, and drank it while deciding what to do next. The men elected Fly, the logical next in command, to the title of captain, and decided to become pirates. They created a Jolly Roger flag, renamed the ship Fame’s Revenge and began robbing ships between South Carolina and Boston. By this time, however, the authorities were in full pursuit of pirates. William Fly and the Fame’s Revenge lasted in their career only three months before they were captured and brought to trial in Boston. It was here that Fly showed his metal as a pirate. 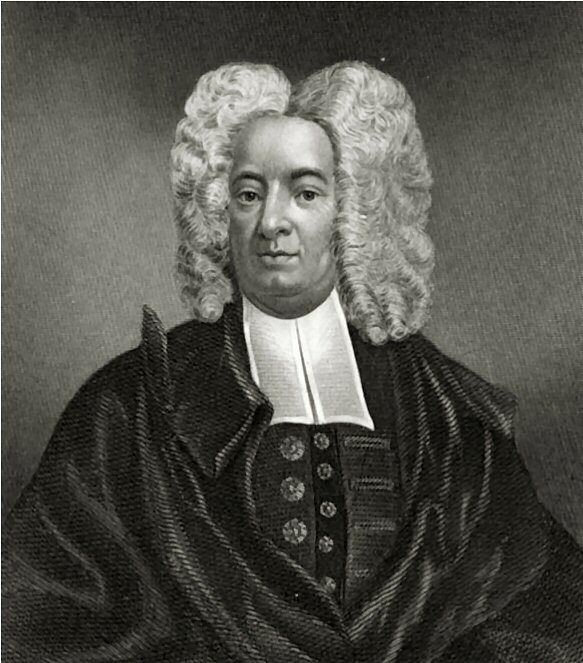 While held in prison, he was visited by none other than Cotton Mather, the famous puritan preacher, notorious for his prosecution of witches during the Salem Witch trials. Mather tried in vain to persuade Fly to recant his sins, to confess, or even to attend church services during his confinement in order to be spared the fires of hell. Fly replied that he hated the church almost as much as he hated the current social structure, and that he would go to his death as a brave fellow. On the day of his hanging, Fly leaped willing into the cart that would carry him to the scaffold in the town square, and bantered with the spectators along the way. Once on the scaffold, Fly took one look at the hangman’s noose awaiting him, berated the hangman for doing a sloppy job, re-tied the knot himself, and placed it around his own neck. He then berated the crowd. Fly stated, in short, that selfish owners and brutal captains brought piracy down upon themselves, and that if seamen were paid on time, and treated like human beings, piracy would not exist. He is quoted as concluding: "Our Captain and his Mate used us Barbarously. We poor Men can’t have Justice done us. There is nothing said to our Commanders, let them never so much abuse us, and use us like Dogs." William Fly and two of his fellow pirates were hanged on July 142 1726. A true pirate to the last, Fly urged all working class folks to stand up for themselves. May his legacy live on.